Your EoP Infusion Pump - Perelandra Ltd. 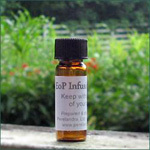 Essence of Perelandra or "EoP" is a gift from the heart of Perelandra. EoP provides the unique balance of the Perelandra garden to add strength, stability and support to . . . anything. The EoP Infusion Pump offers a gentle, continuous infusion of that energy that permeates through the glass bottle and into your body's biosphere on all its levels: physical, emotional, mental and soul. Whether it's in a front pocket, on a cord around your neck or safely tucked in your clothes somewhere . . . Have your EoP Infusion Pump with you every day. Let it help you maintain your equilibrium through difficult times. When dealing with the aftermath of a disaster or trauma, or preparing for a challenging event: This little bottle radiates strong support when you're striving to stay level-headed and make difficult decisions. When you're at the tipping point, the EoP Pump helps you tip toward balance. We suggest everyone keep a few extra EoP Infusion Pumps in your ETS Disaster Bag. Have enough to hand one to each family member when needed. EoP infusion is also useful when you travel, especially if it takes you into a different environment with different food and water than what you are used to. The regular retail price of a single EoP Infusion Pump is $8. You'll save $5 when you buy a discounted 5-pack of Pumps for $35. Bottle Buyers Club also get free U.S. shipping or $15 off international shipping.